In the eight years of data I’ve collected on New England medical device company venture funding, I’ve never seen it this tough. Only four new companies were funded in 2012 (see my complete list below). You might be tempted to blame VC belt-tightening or the “Patient Protection and Affordable Care Act.” You’d be wrong. While the macro environment has its challenges, four new NorCal medical device startups were funded in Q4 alone. 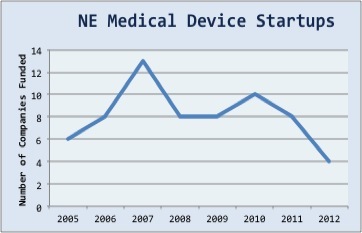 My hypothesis: NorCal medical device entrepreneurs are expert “fast followers.” Look at Sadra Medical and Direct Flow Medical in aortic valves, Kona Medical and Mercator Medical in renal denervation, Access Closure in vascular closure, Claret Medical in embolic protection, Minerva Surgical and Aegea Medical in uterine ablation, Halt Medical and Gynesonics in uterine fibroid treatment, Uptake Medical and PneumRx in lung volume reduction, TriVascular in AAA Stent-grafts, HotSpur and TriReme in balloon angioplasty, Baxano and Benvenue in minimally invasive spine surgery, and Concentric and Penumbra in stroke therapy. Fast followers all. Every medical device market has three or four major players, and those large medical device players need next-generation products for their growing medical device markets. NorCal startups earn big bucks providing them. After Ardian’s big exit, Piper Jaffray Analyst Thom Gunderson stated that “well over 50 separate companies” are developing renal denervation products. As far as I know, none are in New England. (where established companies with great credentials attract employees who end in “a middle management job where you’ll have little impact and never seriously attempt to realize your ambitions.”). In NorCal, it’s cool to work at a startup medical device company. Now take a look at my list of New England medical device companies receiving a first round of funding (below). What do you see? Don’t get me wrong. I’m a raving fan of bold-vision, game-changing, care-transforming, medical device innovation. Lithotripsy beats the heck out of surgery for kidney stones. Give me IOL’s and phaco for cataracts, and LASIK for myopia. New medical devices are likely to be our best solutions for the world’s most intractable and costly diseases. But not every medical device company should be a game-changer. First-to-market companies take on huge risks. They blaze the clinical, regulatory and reimbursement pathways, and create new procedures and markets. For fast followers, engineering execution and IP are all that’s needed. Northern California generates a healthy mix of game-changers and fast followers. For New England to remain vibrant, the regional mix must change. 2011Q2 3 MoMelan Technologies, , PolyRemedy, Fractyl Laboratories Inc.
Of course excellent and overdue! I have noticed that the highest quality reimbursement consulting opportunities are coming from California – in particular Northern California. I would like to add that it is the culture of the area that is succeeding. New England start ups are not supposed to fail. One failure and your reputation is damaged. In Northern California, if you are part of three failures in a row, the sentiment is “wow, you have a lot of experience”. The area is booming now because there are so many innovations. And yes, they are mostly not breakthrough technologies (although some are – look at Neotract and Optimedica for example).